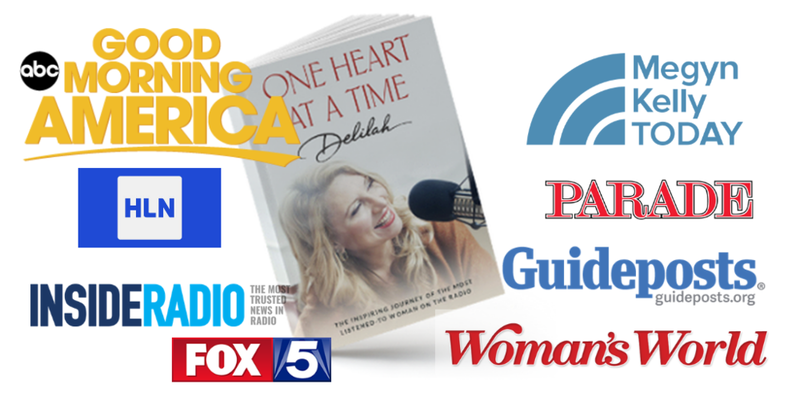 My new book, One Heart At A Time, became available in book stores everywhere on Tuesday, October 16th, and it has recieved so much media attention. I feel so very, very, blessed! It was a labor of love to write, and especially difficult after losing my son, Zachariah, to suicide. Finishing was nothing short of a miracle, but one, with the help of God, that happened. This is the way we will change the world! The book’s release is gathering a lot of attention. Here’s a few of the places I’ve been or have picked up on my story and how I hope to be a small part of changing the world - just as I encourage you to be - One Heart at a Time! Find your favorite - or find new favorites - in the media coverage that follow ! On the show, we were able to talk about so many things - life, farm, kids, and the devastating loss of my beloved Zacky - and I couldn’t help but shed a few tears even though I told myself I wouldn’t! Of course, we talked about my new book, One Heart At A Time, which is available wherever books are sold! I had an amazing time with Robin, she is a warm, engaging, smart, and gracious woman who’s love knows no bounds, I’m so grateful to be included in that circle. Wednesday, I joined another TV legend, Megyn Kelly! I hope you were able to tune in to the TODAY show on NBC! There I was, bright, early, and nervous, with my make-up on and in my Sunday best, talking to Megyn about my book and my life, the challenges, the joys, and how I am so very very blessed. Megyn was engaging, sensitive, and kept me on-track (as I tend to go off on tangents about things I’m passionate about - and I’m passionate about a LOT of things!) I was grateful for her allowing me to share some facts and thoughts about the broken US foster-care system and I hope by doing so it touched both hearts and nerves. We have got to step up and do something about the way that kids are warehoused and shuffled around until their time runs out and they are forced out into society, broken and ill-prepared. I thoroughly enjoyed my time with Megyn, and I hope to do it again soon. Bonus - I was able to meet and hug a bright news personality, Jenna Bush Hager while on the set! Here’s the link to watch the segment! Most likely, you’re going to be in a grocery store line sometime this week. If you’re like me and you are the supply sergeant for a small army, you’ll probably find yourself there multiple times! While you’re standing in line trying to keep your kids entertained, or making eyes at the toddler in the cart in front of you, look around for this weeks copy of Woman’s World Magazine! Yep, that’s me on the cover, in the fuscia colored dress, looking happy as a girl from a small town that finds herself staring back from the cover of a national publication can be! The folks at Woman’s World were so kind and compassionate, as all the media have been, when asking about my family is coping after our loss. I feel so fortunate that they chose to showcase me on their cover, and share a beautiful story of my family inside. I’ve asked folks to share pictures of where they find this issue of Woman’s World magazine - take a picture and post it to Facebook or Instagram with the #radiodelilah, like others have been doing - it’s been a lot of fun! In late September, I was also featured in Guideposts Magazine. I’ve read and loved Guideposts all my life. The stories contained between the glossy front and back covers always inspire and uplift me, and I am both honored and humbled to think that perhaps my story will do the same for you and others. Here is the link to Guideposts video on the role of prayer in my life - something I do every day, all day! InsideRadio launched a new feature on Tuesday the 16th, called “Extra Close Up,” and they chose me to be the first to showcase! As a radio-gal, this has Extra Special meaning to me, and I’m so very pleased and proud to be featured in this new segment. I was in the midst of the media blitz in The Big Apple - New York City - when it was brought to my attention that Parade Magazine had run an article me and One Heart… Here’s the link to that! I loved his directness and his authenticity. I know Mike has the capacity to change the world and a platform to touch many hearts. He did not shy away from asking about my faith, which is central to my being and what gets me through each and every day. We touched on Zacky and Sammy, my radio program, my sometimes crazy but wonderful life, Point Hope… and the big message; Say yes! Open your heart to the possibilities of loving larger and more vulnerable than ever before and the return on your investment will be overwhelming blessings. It’s always great to be able to drop in to Good Day New York when I’m in the city! I had a delightful time with the morning team, and even though I’d covered the ground (I thought) several times before, found there is always more to talk about! My heart feels so full and hopeful as I am gifted the opportunity to share my message with so many people on so many platforms. I know there will be more to come, stay tuned and thank you for being a part of my world and my heart!